Much of this past week I was in sunny Florida, visiting customers and making sure that projects were moving right along. I’m not a great fan of business travel; we know way too many people who spend 6 of every 7 nights in a hotel and that life’s just not for me. I do enjoy the occasional trip though, and Florida’s almost always a welcome destination. This time I was to visit two cities, and rather than going back through the whole process (return the rental car, go through security, wait at the gate, etc. etc. etc.) I just drove from Ft. Lauderdale to Orlando. It wasn’t too long a drive, and I got to see plenty of Christmas decorations, Florida style. Even the palm trees get lights here. As usual, I had loaded up the iPod with plenty of podcasts for my time on the plane and while driving, and just before the trip I’d come across a new one — new to me, anyway. The guys at Side Stand Up Sydestand Up bill themselves as “The Worlds Only Motorcycle Radio Road Show,” and they’re definately having a bunch of fun. I was listening to it while on my way to Orlando, and was pleasantly surprised to hear them say that they’re broadcasting from a location “on the east bank of Lake Apopka.” Hey, Lake Apopka‘s in Orlando and that’s just where I’m heading! I sent an email to Tom, one of the hosts of the show. 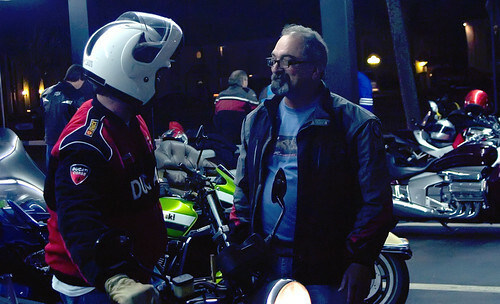 We met up for dinner the next night then went and hung out at a weekly gathering, Bike Night at Steak & Shake. 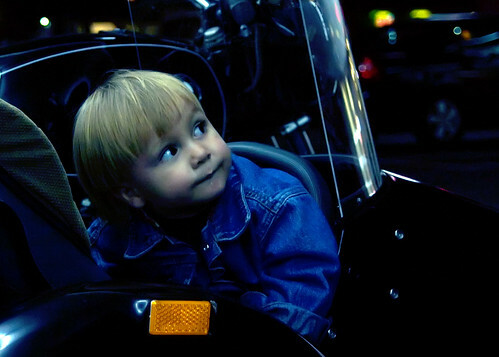 This little guy enjoys riding in “his” sidecar on grandpa’s bike. After his snack of fries and a milkshake, he was ready to get back on the road. Even after the passenger’s ready and grandpa’s got his helmet on, good conversation continues. Here’s Tom himself, pausing for a quick shot next to his “rolling scrapbook.” There are stickers on there from Key West to Pike’s Peak to Alaska and all sorts of places in between. 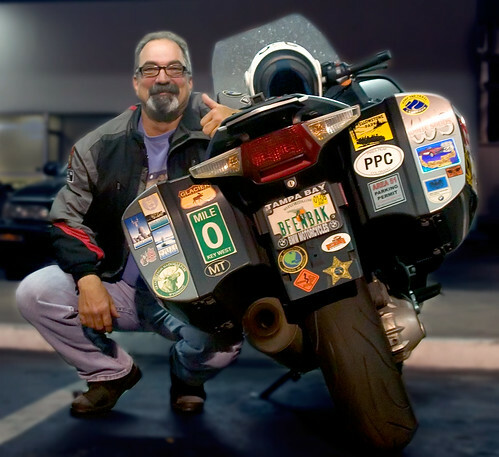 Tom’s trusty BMW has taken him all over the country, and he’s planning an even longer trip in the upcoming year. It sounds like an exciting adventure, and I’m looking forward to hearing of his travels. too kewl. I love Tom’s license plate…the windshield sure looks like it has seen some action.